0049 30 755 16 128? The Politician foundered on the rocky reef at Calbhaigh that skirts the island’s northern shore. There she broke in two, conveniently well within reach of the shore. It was not long before even Eriskay’s famous ponies were drunk! Around seventy years ago, news of a windfall reached the small Scottish island of Eriskay. An unexpected gift which, it was suggested, might be used to buy wool to support the island’s tradition of spinning and weaving. Actually Eriskay had plenty of sheep, so wool was not in short supply. But there was one thing that Eriskay did not have at all, and that was a road. And thus it came to pass that, through a small philanthropic gesture, this remote island outpost acquired a humble lane that led inland from the old pier at Haunn, skirted the shoulder of wild Beinn Sciathen and then dropped down to the picturesque harbour at Acairseid. Eriskay was, of course, in the news a few years later when it had another unexpected windfall, as the SS Politician ran aground one wild night in February 1941. The Harrison Line ship was en route to Jamaica, carrying a cargo of currency and whisky — over a quarter of a million bottles. The Politician foundered on the rocky reef at Calbhaigh that skirts the island’s northern shore. There she broke in two, conveniently well within reach of the shore. It was not long before even Eriskay’s famous ponies were drunk! Compton Mackenzie romanticised the whole affair of Whisky Galore! in his affectionate comedy about the wee Hebridean island with a massive communal hangover. Even today visitors to Eriskay will find the incident recalled in the Gaelic name of the island’s pub, Am Politician. Behind the bar they still have one or two bottles of the whisky, certainly no longer drinkable, that the islanders ‘liberated’ from the ill fated ship. As is so often the case, the popular recollection of Whisky Galore! shrouds a darker side to the tale. Some of Eriskay’s young men were sentenced to jail terms on the Scottish mainland for their role in relieving the SS Politician of its alcoholic cargo. The story of Whisky Galore! is much more well known than that of Eriskay’s first road. In the summer of 1934, a chartered yacht appeared off the coast of Eriskay. With her distinctive sleek white hull and four sails, the Elspeth became a familiar sight around the coast of the island. The German man aboard, Werner Kissling, spent many weeks tramping Eriskay’s little trails with his notebook and cameras. Kissling was an émigré from Prussia. As a young man, he had studied in Berlin and Königsberg (now Russian Kaliningrad). When Kissling was just ten years old, his mother Johanna had travelled alone through the Scottish Hebrides, even visiting St Kilda, and young Werner clearly wanted to follow in her footsteps. As a young man in the service of the Reich, he was in the German delegation to the League of Nations, and then held diplomatic posts that took him to Spain, Hungary, Switzerland and eventually to London. By 1933, with some strong political currents brewing in Germany, and after having already visited the Scottish islands at least twice, Kissling had given up the security of his diplomatic career. He dedicated himself instead to photography and anthropology. Eriskay was relatively unknown when Kissling arrived in 1934, and his subtle eye behind the lens immortalised this island community on the brink of change. The ponies laden with creels of peat walking surefootedly across the slopes of Beinn Sciathen; the faces of Morag MacInnes and Mary MacMillan with their carding combs; the textured features of Bean Iagain Mhoir, her hair covered by a woollen scarf, as she watches the rhythmic movement of the loom; the waulking of the wool, and everywhere Eriskay’s deeply expressive faces. There is something truly magical about Kissling’s Hebridean photography, and his film, Eriskay: A Poem of Remote Lives, is a remarkable and touching piece of cinematic history. It is a film that has no stars beyond the ordinary inhabitants of Eriskay. In that respect, it stands alongside another classic of early Scottish cinema, Jenny Gilbertson’s The Rugged Island, set in Shetland and also made in 1934. Kissling made his film and returned to England. He had good connections with London’s Royal Geographical Society, at the University of Cambridge, and more widely in the English upper classes. And so it was that, under the patronage of the Prince of Wales, soon to become King Edward VIII, Werner Kissling’s one and only film had its première in London. This auspicious event took place on a Tuesday evening, 30 April 1935, and a glittering cast was in attendance, but sadly no-one from distant Eriskay. The showing of the film was at the Marquis of Londonderry’s home, as part of a Hebridean evening, with musical entertainment by the London Gaelic Choir. The roll call of sponsors was impressive and included Prime Minister Ramsay MacDonald, the Duke and Duchess of York and men with good Gaelic pedigrees: Macleod of Macleod and Cameron of Locheil. The money raised that evening was sent to Eriskay and funded the first road. 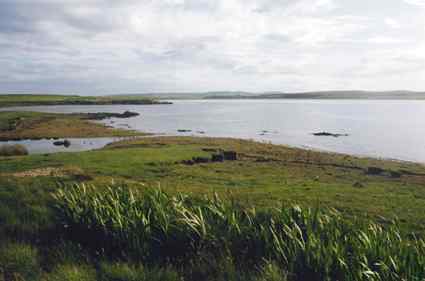 Kissling returned to Eriskay many times, promoting the interests of the islanders. Over the last seventy years, Eriskay’s population has halved, but there is little risk of Eriskay going the way of other Outer Hebridean islands, like Mingulay and Pabbay to the south, which have both, for almost a century now, been devoid of living souls. The key to Eriskay’s assured survival was the completion of a new causeway in July 2001 that linked the island with its northern neighbour, South Uist. With that new road link across Eriskay Sound, another important milestone was reached in a project started over sixty years ago. For it was way back in 1942 that the first two islands in the Outer Hebrides spinal route were linked by road, the South Ford Bridge from Benbecula to South Uist. Over the intervening years other causeways have been built, and now it is possible to drive in a single day from the Point of Ness, at the northern tip of the Isle of Lewis to the southernmost inhabited Outer Hebridean island, Vatersay. True, the journey still requires two car ferries, but the 170 km drive is one of most sparkling routes in all Europe. Nowadays, tourists and locals speed over the thin ribbon of tarmac on the causeway from South Uist, many in too much haste to catch the new car ferry south to Barra. Some scarcely notice that, for a few minutes, they are on Eriskay. The road across the island has been upgraded, and some government official in distant Edinburgh (or even London, perhaps) has probably given it a number. But for those who take the time to linger, Eriskay still has an island magic all its own — not quite the same as it was in Werner Kissling’s day, but still utterly distinctive and worth exploring. And, for those who probe a little deeper, there is still near Acairseid a little stretch of the original road, still called in Gaelic Rathad Kissling ‘Kissling Road’. Eriskay has no direct ferry connection from the Scottish mainland but it is easily reached via the new South Uist to Eriskay causeway, from Lochboisdale. This little port has a useful direct ferry link from Oban. The summer 2005 service is four times a week and takes about six hours. The North Uist port of Lochmaddy is about an hour’s drive from Eriskay, using three inter-island road causeways. In this summer’s schedules, Lochmaddy is served ten times a week from Uig in Skye. Those driving the Outer Hebridean spinal route mentioned above need to plan carefully. The journey is on generally slow roads and requires the use of two ferries: from Leverburgh on Harris south to the island of Berneray, and from Eriskay to Barra. The 2005 summer schedules allow for the journey to be completed in a day, leaving the Point of Ness around 9 am, taking the lunchtime boat across the Sound of Harris, which leaves plenty of time to connect into one of the last two sailings of the day from Eriskay across to Barra. These are at 4.25 pm and 6.55 pm. It behoves travellers in the Outer Hebrides to be aware of the differing religious sensitivities of the various islands. 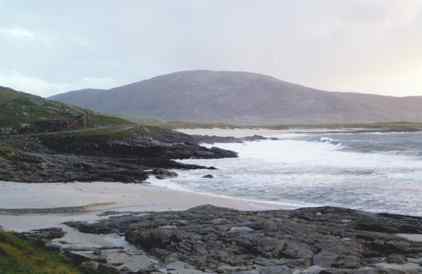 The southernmost islands, including Eriskay and Barra, are devoutly Catholic. Arriving in the Barra port of Castlebay, the most striking feature is the huge statue of the Madonna behind the town. In the Catholic islands, life does not stop on a Sunday, and the ferry linking Barra to Eriskay thus runs daily. A little to the north, things are very different. The Protestants of Lewis and Harris have always countered plans to run Sunday ferries with great determination. So the Sabbath is very much quieter in these more northerly islands, and the ferries remain firmly chained to the quayside. A guide to the Isle of Eriskay and its causeway. A guide to the community on the Isle of Barra. This impressive, map-rich and interactive site includes Eriskay and Barra and boasts a fine picture gallery. If you enjoyed reading the above article then you will probably also enjoy Sicily by Nicky Gardner, and Lausanne, also in Europe, and our latest articles covering the Orinoco Delta, La Mata, Marbella and Beijing.